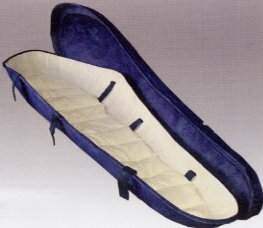 Journey Earthurn is perfect for ocean or deep water burial and is accepted for Royal Navy Burials at sea. These biodegradable urns are engineered to float momentarily and then gracefully sink. Once on the ocean floor, the urn will break down naturally over time. Simplicity Earthurn is a simple and durable urn that opens easily for scattering or it can be used as a biodegradable urn. Once buried the Simplicity Earthurn will biodegrade naturally. Earthurns are handmade using a centuries old paper making technique. The bark from the mulberry tree is harvested, leaving the tree alive and intact. After the bark is soaked, the resulting pulp is laid out on bamboo screens, often with floral material inlaid, and dried in the sun. Once dry the paper is used to create the beautiful and earth-friendly urns,which will break down in water or soil. The ecopod is an ecological coffin made from compressed newspaper. It can carry a person up to 115 kilos and up to 6ft (183cm) tall it but weighs only 14 kilos. Safe transport is made possible by a specially designed webbing cradle. The pod can be carried by family or friends of different heights using the handles provided. All ecopods are supplied with a fitted calico mattress and can also be supplied with a feather lining. Woodland Burials offer an environmentally friendly, cost effective & permanent alternative to traditional funerals, cemeteries and graveyards. Our funeral designs are less traditional and more of a tribute to your loved one. We create Woodland style designs which will blend into the burial site. They include Eternal Circles made from Cane and vines, Rose adorned Crosses made from Rose Stems bound with vines, and simple Tied Sheaths filled with country style flowers and Herbs. All prices include a Sentiment Card and delivery to the Burial Site or Funeral Directors. If you are planning a woodland, natural or green burial you can choose one of these designs made completely from natural materials which will decompose causing no harm to the environment. We understand that funerals are distressing and at this difficult time we are here to help. Let us create a floral tribute straight from the heart, either traditional or unconventional and let the flowers do the talking. We are also specialists in biodegradable funeral tributes wholly suitable for eco-friendly and woodland burials. Working closely with your chosen funeral director, we will help to make the process run as smoothly as possible. Welcome to Yealmpton Woodland Burial. Yealmpton Woodland Burial is set in a beautiful part of the South Hams with far-reaching views of Dartmoor and the Yealm estuary. Losing a loved one is never easy, and ordering flowers at those hard times can sometimes be difficult. That�s why at Flowers Going Green, we offer a free home consultation service if required. Sympathy flowers should be personal and meaningful, our fully trained staff have the knowledge and compassion to help guide you through the choices.